It is a ritual to taste special and local food when you are visiting another country or even a town. Venice is no excuse as well. The cuisine and the ingredients are very unique in this island. The restaurants and the service are also one of a kind. Local food in Venice is something easy to find. In every street or in every corner there is another thing you can taste or another restaurant. Keep in mind that even though there are many restaurants and eateries in Venice, less than 5% is owned by local people. And also locals eat at locals’ places. This creates a great shortage of “actual” local food in Venice. But don’t worry, we have the answer for the locals’ favorite places. Here are the 12 favorite local restaurants in Venice. Being a popular tourist city can make traveling more difficult. Because in the end, you will have many options but very few criteria that you can judge. In that situation, you will need an inside information from a local – and that would be the best! They live there, so who can know the best places, hidden bars or cozy restaurants better than them? Venice is one of those places that you should look for a local info. Fortunately, we are here. There are few things you should know about Venetian style eating. First of all, the real Venetian service is most probably impolite according to your standards. Also, ask them for the best or the most favorite dish of the place – if they speak English. In Venice, there are specialized restaurants for everything. So for wine, go to a wine bar – bacaro. For fish, go to a restaurant famous for fish – approved by locals. Here is our guide for the best local food journey in Venice – eat like a real local. Paradiso Perduto – translated as lost paradise- is a magical place where you will see a very lively crowd inside along with a superb staff. As the place is both loved by locals and travelers, it is pretty busy. They usually come here for a Venetian meal. The seafood platter is impeccable here. Also, you can opt for northern specialties such as bigoli – a type of handmade pasta in Veneto region. On Monday nights they have a live music after 9 PM as well. Heaven on a plate ? When you look at from outside, this trattoria may not seem appealing to you. However, it is one of the most preferred places by locals in Castello area of the main island. Here there is no pretentious meals or service by the staff. Get ready for a Venetian style service here, come early to be served. It is not close to the regular touristic path so there will be no crowds except locals here. If you don’t know what to order from the menu, ask for an advice as they work with seasonal ingredients here. Rosticceria Gislon is a life saver between the busy narrow streets of Venice. They have two different type of service here. If you don’t mind eating like a local and don’t want to pay coperto; stay downstairs. Choose the self-service version and arrange a plate according to your wish from the displayed dishes. You can have fried nibbles like arancini or some polenta but also grab really good seafood platters or pasta. Have some house wine here as well. The place gets pretty crowded by locals during meal times so make sure you come by early. Dalla Marisa is another place very often filled with local people. As in many restaurants in Venice, you might feel like there is an uneven atmosphere here. That’s because you’re in Venice! In Dalla Marisa, there is no menu. You are basically served what they have to offer that day. If you want you can go for their fix menu during lunch with two courses, a soft drink or water and also an espresso in the end – like a real Venetian meal. If you want to know where locals hang out to eat really good seafood and especially fish, this is where they have it. When you are in Venice, do not try to order regular and simple Italian dishes like pasta alla pomodoro. Here, you have to taste their own specialties such as seasonal fishes or seafood platters. The owner will make an exception and will prepare your dish next to your table – it might even turn into a show here! Certainly, a well-recommended fish place by locals in Dorsoduro area, stop by at Osteria Ai Do Farai! Pay a visit to Taverna Scalinetto if you want to enjoy a Venetian meal but opt for a better and a friendly service. Here you will definitely have a more elegant atmosphere with a pleasant table service. You can go for the seafood platters of spaghetti al vongole – which is served with mussels. Interestingly they have very good duck ravioli as well along with delicious desserts. If you are in Castello area and would like to have calm, relaxing and local-like dinner – this is where you should be visiting! It is well-known thing that you will visit many wine bars – bacari in Venice. How about eating a good amount of cicchetti and local wines at the oldest bacaro in Venice! Of course yes! Cantina Do Mori is the oldest bacaro in Venice founded in 1462. Inside you will see a lot of different equipment, wine barrels and the ceiling is covered with old copper baskets. Cantina is still well appreciated by locals both during lunch time and during aperitivo. There is an abundant variety of cicchetti here so you can have light lunch or a regular aperitivo here. A must visit place for Venice both for history and local cuisine. Cantina Do Mori dating 1462, where apparently Casanova frequented it. This little osteria is located on the meeting point of two areas Canareggio and Castello. The interior and the setting is quite rustic as you will see empty wine glasses on the shelves and on the ceiling, there are copper kitchen pots and pans. The menu is quite well designed – not very extensive but the cuisine and taste focused. You should go for Venetian style dishes such as sardines, octopus, codfish or spaghetti alle seppie nere – with squid ink sauce. Cantina Do Spade is like a two in one. You can enjoy here with some cicchetti and local wines during aperitivo or lunch. On the other hand, you might come to a local Venetian dinner. The place is one of the oldest trattorias of Venice as well and they’re proud of what they do. So make sure you follow their advice while ordering. The favorite dishes are baccala mantecato – creamy salted codfish, bigoli with anchovies and onions, Venetian style liver, mussel stew and squid ink spaghetti. Osteria ai Pugni is located right next to the canal in Dorsoduro area. 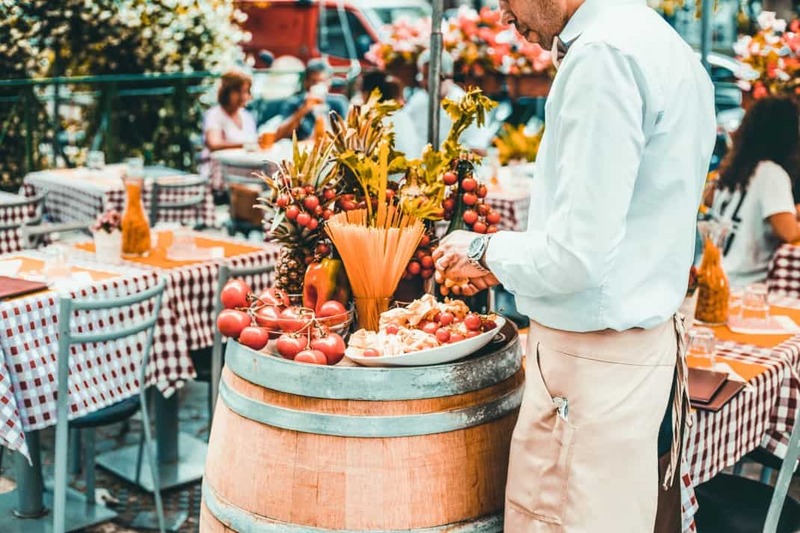 A small place which offers both cicchetti and wine option but also has pasta dishes and some daily specialties according to the season and the supply. The dishes are very reasonably priced as well. It’s another sign of why locals hang out here as well. Another great thing is that for a local favorite this place is very friendly with travelers as well! Al Gato Nero is a restaurant located on another island of Venice which is famous for its lacework: Burano. This little island is a well-known place by locals but it might be hard to find a place to eat. Al Gato Nero is a place both loved by locals and now known to travelers. The place is located right next to the canal adjacent to the sea. If you find a place outside, you’ll have a great view as well. Unlike other places on the main island, here the prices are a bit higher but the view, service and the food will cover that for sure. Life is full of surprises – so is Venice. When you think that you will not find a cheap and easy going place in Venice, there is this kind of place: Bacareto de Lele. Do it like how the locals do. Grab your food and wine from the counter – it is a super tiny place- and eat outside. You can either settle outside of the place or sit down near the canal and enjoy the view. The price and quality ratio here cannot be beaten here!